For the majority of our clients, when creating a new source (SRC) the default setting is to automatically add the new source to every filter set in the corresponding lead type. (This is not true if your system default is set to add new sources to no filter sets.) 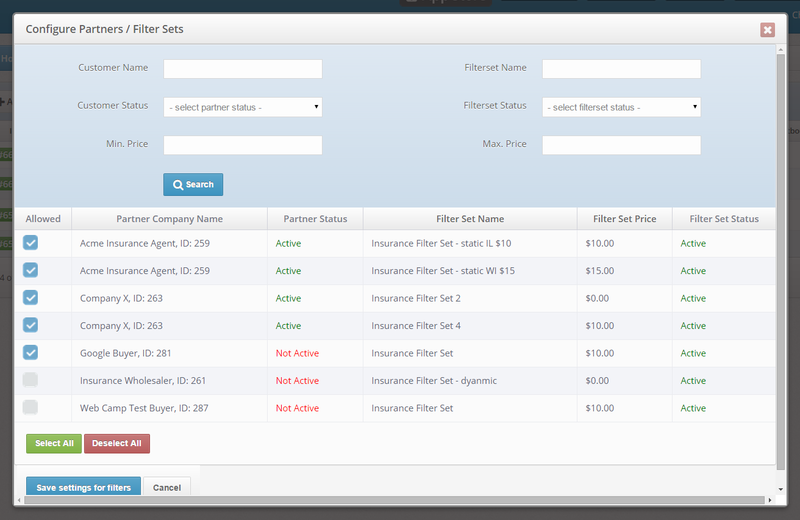 This allows you to seamlessly add new lead sources without having to manually update every individual filter set. However, what if you want to segment your leads more intelligently and match them with specific filter sets rather than each one? Your boberdoo system has a tool to help you do just that. To access this tool, go to Settings>Source/Vendor Settings and select the gavel icon in the tools column for any source. From here you can see all of the filter sets that are accepting leads from this particular source. You also have the ability to search within this list by several different variables. Finally, you have the option to either allow or remove any of the particular filter sets. Once a filter set is removed, it can no longer accept leads from this particular source. Whether you’re buying leads, generating your own or both, there’s likely some variation between each source when it comes to lead quality and therefore, lead value. Let’s say you want to sell leads that you generated via paid search for $20. However, you are selling your email leads for $10. If you add a new paid search or equivalent source to a lead type and it is automatically added to each filter set, (including those selling at $10) you are cutting your potential revenue for those leads in half. Because of this, you would have to manually adjust each filter set to account for this. However, with the configure partners/filter sets tool, you can search by filter set names (if you implemented a standard naming convention) or even price to remove any filter sets that should not be receiving leads from this source. This is just one example of how to utilize this tool to manage your sources and filter sets. There are certainly many applications to this tool that can keep your lead business running as smoothly as possible. Anyone in the payday industry knows exactly how important it is to keep your pricing tiers in order. It is also important to note that utilizing a standard naming convention for your filter sets is extremely important. It makes it easier to not only manage your filter sets on a one-off basis, but certainly in a bulk situation like this. If you would like more information on how to utilize this feature, feel free to reach out to support.